Hello crafty friends and Happy New Year! 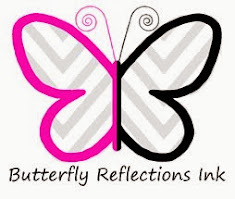 I am so honored and excited to be joining the amazing Butterfly Reflections Ink Design Team with so many talented ladies! Today I am sharing my first card using the latest Lawn Fawn's I Love You (Calyptus) stamp set and other amazing products from their latest release. Once I saw this adorable Koala I couldn't wait to use it especially with Valentine's Day right around the corner! To start my card, I ink blended my panel on smooth Bristol paper using Distress Ink Oxides in Tattered Rose, Spun Sugar, and Picked Raspberry. Once dried, I then used Lawn Fawn Polka Heart Backdrop Portrait and ran it through my die cutting machine. I removed the little hearts and placed them aside while I glued my ink blended panel to my card base. I decided to place the hearts back in but reversed the colors. I thought this technique gave it more contrast and extra detail. For my hearts I used Lawn Fawn Outside In Stitched Heart Stackables Die with their Perfectly Plaid Spring paper. I glued down the larger heart directly to my panel and the smaller heart I adhered using foam adhesive. I stamped the Koala using Altenew Evening Gray Crisp Dye Ink and colored with various Copic Sketch markers. I added some Lawn Fawn Chunky Glitter to the smallest heart that the koala is holding. I adhered my koala and the heart using foam adhesive. To finish off my card, I used the coordinating sentiment which I stamped using Altenew Razzleberry Crisp Dye Ink onto a piece of Lawn Fawn Fake Tan Cardstock. I then added some Lawn Fawn Prisma Glitter underneath my sentiment. I adhered my sentiment using foam adhesive to my card panel. I hope you enjoy this card as much as I did creating it. Thank you for joining me here today and hope you have a fabulous day!